It's that time again Sleepyheads! Let's chat about Lilith, the seductive yet scary succubus in this week's Sleepy Hollow Round Table. 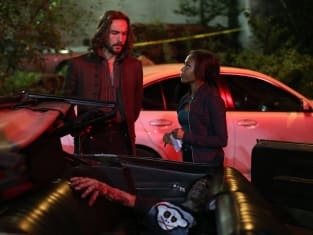 Join TV Fanatics Stacy Glanzman, Whitney Evans, Jim Garner and Henry A. Otero as we discuss the Incordata, Katrina and Hawley's relevance to the series and other topics from Sleepy Hollow Season 2 Episode 8. What did you think of the Incordata? Share your thoughts on her succubus creature form and the visual effects. Stacy: I liked the succubus story line this week. The special effects weren't bad; she was definitely creepy in her demon form. I liked that Hawley couldn't quite remember what she looked like in human form until he saw her again. He could only remember a vague description of her because of the spell he was under. Whitney: The weeping lady is still my favorite "villain" this season, but the succubus was a pretty cool creature. She was definitely creepy in her demon form and I liked the back story. Jim: I thought they did a pretty good job with her. I like how she quickly adapted to look like her victims wanted. If you look, she had glasses for the nerd, bangs for Hawley, and long flowing hair for Ichabod. Was a very nice touch. Hank: Same here Jim, loved the way she adapted for each of her victims. She also took on the appearance of the girl's friend before seducing and draining her life force. Very cool detail for a succubus. I thought the demon form was scary as hell. Wowza the creature design on this show is outstanding! Favorite Ichabodism of the week? Stacy: Definitely the opening scene watching Fox's version of The Bachelor. I guess ABC must have a copy write on "Will you accept this rose?" The whole scene had me laughing out loud and I don't even watch reality tv. Whitney: Icahbod in a nightclub is something I never thought I would see. His reaction to the loud music was great. If this show doesn't let Ichabod show us some of his dance moves, I will never forgive them. Jim: I really liked Hawley and Ichabod's unintentional bonding when Ichabod teases him over who should have gotten the gun after they killed the Incordata. Hank: Stacy I can't stand so-called reality TV, but I also thought the opening sequence was hilarious. "Romance? This is not romance, this is shameless groundling kabuki. These people would not know true love if the Bard himself wrote them a sonnet." Sleepy Hollow Photos from "Heartless"
Any thoughts on Jenny and Irving taking a backseat to Hawley? Did the show need this new character? Stacy: I like Jenny, Irving, and Hawley but they're all supporting characters that don't necessarily need to be in every episode. I don't know if the show needs him, but I like him and I think he adds to the story. Our heroes can use all the help they can get at this point and I think that includes Hawley, conflicted as he may be. I think he genuinely cares for Abbie and wants to help. I loved when Ichabod asked him what his intentions were with Abbie and he wanted to know if she asked about him. Whitney: I agree with Stacy, the supporting characters don't need to be in every episode. I really like the dynamic between Ichabod and Hawley, they're slowly developing a bromance and I am totally on board. And even though I am an Ichabbie shipper through and through, I'm not opposed to a Hawley/Abbie pairing....for now. Jim: Honestly Irving is a lame duck right now while he is stuck in the nut-house, and we got a lot of Jenny last season. I think the show needed Hawley, as they needed someone who could bring in "the toys". Look no further than the shaman dagger he gave Ichabod for proof. Hank: While I don't mind Hawley as a character, the "love triangle" thing is so overplayed on every TV show. I don't think Sleepy Hollow needed to create animosity between the Mills sisters, and I can see that coming. Ichabod's irritation towards Hawley is fun, I like that part of it. It's true the supporting characters don't need to be in every scene but we've now seen Hawley more than both Jenny and Irving. Not sure I dig that is all I'm sayin'. Katrina had more to do this week. How do you feel about the character and the fact she returned to Abraham? Stacy: I honestly don't like Katrina that much. I don't hate her, but she just doesn't add to the show as much as the other supporting characters. If they killed her off it wouldn't bother me. I just don't see any real chemistry between her and Ichabod. As far as her returning to Abraham, I think it shows how naive he really is. He must really love her to be so willing to believe she's returned to him because she actually cares about him. Whitney: I've never been a Katrina fan, mostly because I don't feel like we've really gotten a chance to really know her. We've barely spent any time with she and Ichabod together, so it's hard to be invested in them. It makes sense she would return to Abraham because that's the only way she can stay in Henry's orbit and she's made it painfully clear that she's not giving up on him anytime soon. Jim: I was hoping she would stay with the good guys. She feels so under-used when she's trying to be all "spy like" on Henry and Abraham. Apparently the writers think keeping Ichabod and Katrina apart somehow helps the story. Hank: Jim you're absolutely right Katrina is totally under-used. This is supposedly one of the most powerful witches of her time. Have we witnessed her power? Not so much. She's been relegated to hexes and spells requiring an "anchor." Hell if it weren't for Abbie the Incordata would still be around. True that she's doing this to stay in Henry's orbit as Whitney said, but I'm hoping he's unredeemable. He should finish his mother off. Thanks to the enchanted necklace baby Moloch appears as a normal baby. Will Katrina care for the demon? Stacy: I think she'll have to pretend to now that she's back with Abraham and Henry. She's supposed to be the mole on the inside and gather information, and the only way to do that is to make them believe she's on their side. I don't know how long that will last though. I think Henry is still skeptical. Whitney: I think she will put on a brave face, but I hope she's not smart enough to care for a demon baby!!! Jim: Given the surprised look on her face, I would guess she will certainly start to do so. But, like Whitney, I'm REALLY hoping she is smart enough to realize it is an illusion. Hank: This entire scenario seems like a twisted "do-over" since she missed the opportunity to raise Jeremy. Katrina tends to forget Abraham is headless thanks to the enchantment, perhaps she'll become confused with baby Moloch as well. Of course, something will happen to the necklace to remind her she's holding a demon Ha! Have you missed an installment? Don't forget you can watch Sleepy Hollow online via TV Fanatic! And here's your first look at Sleepy Hollow Season 2 Episode 9, "Mama." Abbie: This is supernatural. I'm putting my money on Henry being behind it. Ichabod: A wager I would not bet against. Permalink: This is supernatural. I'm putting my money on Henry being behind it. Katrina: Ichabod you said that the secrets I've kept from you are bygones, but I know trust can be hard to rebuild once it's broken. Ichabod: In truth, it pained me to think you were not who I knew. Katrina: Who I was never changed. The things that I kept from you were things that I had done. Ichabod: As a witch, as a spy. Katrina: Roles I undertook during the war. Ichabod: Nevertheless they are part of who you are and secrecy is a hard habit to break. Permalink: Nevertheless they are part of who you are and secrecy is a hard habit to break.